Even before starting to talk about this film, as a piece of art, I would like to recommend it. Its a must see, no mater what are the ratings and what are the short comings. This Golden globe award winner movie, apart from being very contemporary, gives a message that is required to be told and retold to the world. Every one wants peace. Terrorism or militancy is idea of a group of people to achieve peace. Its a classic clash of dilemma that everyone faces in their dire times. Many a times it happens that as a group of people we are fighting for a cause, and over a period of times fighting becomes more important and bigger than the cause itself. These are the times for introspection. Look inside and check your self. Is the path you are taking the correct one? Aren't there any alternatives? Unless we ask ourselves this question, we are not going to find any alternatives. Unless we ask ourselves this question the power of hatred is going to spread across the world. Let us stop for a while and think about what in the world is wrong that fights and Jehads have become bigger than the cause they were started for. Nablus. A small search on the world map will tell you why is Nablus the most unexpected place as it is mentioned here. This beautiful city of Nablus is the part of west bank which is under the Palestinian Administration. The Movie is based in Nablus and is hence a Palestinian view of put forward by a Palestinian director of the movie Hany Abu-Assad. 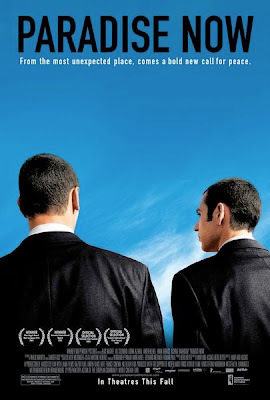 The movie talks about the place which is one of the important nodes of unrest under the Israel-Palestine conflict. The district has about 14 Israeli settlements with a population of around 10,000. It has the largest Palestinian Refugee camps in west bank, Askar and Balata, which means it has the most concentrated amount of wrath of palestinians against the Israelis. To know this is important to understand the story of the film. The basic language that the people here use is also important for understanding the same. Israelis settlements are called "Occupation" and the Israelis are called the Occupants. A palestinian resident who works along with the Occupants for whatever reason (Money, safety etc.) is a Collaborator. And the one who kills the occupants and helps in the cause is a Martyr. (I am sure a film if shot in Kashmir, on similar topic might have some similar definitions. This whole background of the place makes it the most unexpected case for making such a movie. The movie is about two childhood friends, Said (Kais Nashif) and Khaled (Ali Sulaiman), who are a part of the Muslim Majority of Nablus. Both of them together represents two different psycholgy, two different kinds of people, two different temperaments and two different ways of thinking. Said is the one who is thoughtful and contemplates everything a lot before doing anything while for Khaled if he thinks it is correct, he just does it. This could very well be seen in the first scene were impulsive Khaled loses his job from the garage for his rude act towards the customer. Khaled feels that whatever is done by Israelis is wrong and he will be a martyr one day for the cause of good. Said on the other hand has a past, his father was a "collaborator" and he needs to clean that black spot out from his past and feels that whatever "occupants" do to exploit the residents and turning them into collaborators is a big crime in itself. He too is determined for the cause. The movie goes on to slowly introduce the two of them to us as they sit, sipping a cup of tea and smoking the hukkah, on the hills of Nablus. Suha (Lubna Azabal), is a new comer to Nablus but her roots lie there. Her dad was a Martyr and she does not believe in fighting fire with fire. She comes to us as a fresh external view to the everything happening in Palestine. Her relationship with Said is flourishing into a nice romantic tale for her. Both Said and Khaled had volunteered to become Martyrs to match the might of Occupants, they had volunteered to become suicide bombers against Israel. And then comes a day out of the routine of their lives when they are told that they are to execute the plans on the next day. Jamal (Amer Hlehel) and the resistance group tells both of them that the next day they have to go to TelAviv and bomb the Military check point there, blowing one after the another causing as much damage as they can. Before going on the mission they have one day to stay with their family. That night, Jamal stays with Said and his mother (Hiam Abbas). Then starts the missions with them recording a message in name of GOD and their cause, bidding their family good bye. They shave of their beard and hairs to look like the occupants with a co ver of wedding and are attached with an explosive belt, which they need to blow once at their target. They are briefed about the entire plan on how they are to cross the border and move into the Israel occupied area and how would they blow the place one after the other. As both of them sit near the border waiting for a call to cross it from the other side, they talk and Said asks Khaled "Is this right?" and you can very well sense the dilemma in the eyes of Said. Khaled knows this is right. And he knows this is the only thing that is right. As they try to cross the border, Said could cross it and go in to the other side but Khaled has to return as someone has informed the forces there about their attack. Khaled for the first time in the story, gets separated from Said. And Said feels that the cause is bigger than him and his friendship. He has to go there and blow them apart. As he reaches a bus stand where he wants to blow of the people who has inflicted those pains on his people, he sees that everyone around are just normal people, like him and his family. He sees children whom he cannot blow in name of GOD. He returns in despair. Khaled on the other hand starts searching for Said as he understands that he could be killed either by the militants who had sent them or by the forces in Israel. Khaled keeps on searching for Said who in the mean while visits the various parts of Nablus, confused, disheartened, not knowing what to do. He goes to his family but runs away from there. He has a cause to fight for and he could not meet the same. Khaled realizes that in times of such desparir his friend will go to his father's grave and Khaled finds him there as he moves around searching for Said along with Suza. In the time they were searching for Khaled Suha tells Khaled that this is not "the way" to solve the issues. They debate and Khaled understands her point. They find Said and dismantles the bomb. Now, after a lot of introspection, Said is convinced that the mission should not be dismissed and he has to do it for his father's sake. He has to do it for his cause. he tells the same to Abu Salim(Mohd. Bustami), the resistance leader. "The biggest act of courage sometimes is the one you don't (do)"
The movie is not one of the most brilliant cinematic experience that you might have watched, nor does it claim to be one. Writer-Director Hany Abu Assad and the producer Bero Beyer are to be applauded for attempting this. The flow of the movie is kept very simple and nice. "Sounds like you're not from here." " They make a lot of cinema in France. Have you seen Cinema?" "Yes, 10 years back I had gone to Royal Cinema to burn it." "What has cinema to do with all this, why cinema?" Editing, Music and cinematography disappoints and just loses everything that everyone else puts in to make a good movie. Acting by Kais Nashif is the best part of the movie. He acts well in a role of thoughtful Said, who is always in a dilemma of what is good and what is right. Lubna Azabal too shines in her small role. Ali Sulaiman is good in parts. He fails to impress in a very important scene when he is debating with Lubna about reaching the "Paradise Now". Others support the lead actors just adequately. No brilliant performances there. This too brings down the impact of movie at times. But here is a strong strong recommendation for this movie, for what it says more than anything else. 3* for the movie. And a heart for the message. Look!!! She is here : Malena - A movie review.